The story of the Golden Gate Quartet begins in the early 1930s at a barbershop in the Norfolk, Virginia suburb of Berkeley. It was there that owner A.C. “Eddie” Griffin, a tenor singer, and Robert “Peg” Ford, a one-legged bass vocalist, recruited two Booker T. Washington High School glee club members, tenor Henry Owens and baritone Willie Johnson, to form a quartet singing gospel music in the new “jubilee” style that was beginning to sweep through Virginia churches. Unlike, say, the older Alabama gospel tradition, with its trademark reliance on formal song structure and straight-ahead harmonies, Virginia’s gospel music was looser, and more rhythmic. Influenced by such varying sources as the pop group Mills Brothers, the swinging jazz of the Three Keys, and the emotional wailing of area pulpit preachers, jubilee singing was something daring and exciting – gospel music geared for the body as well as the soul. It was the youthful energy of jubilee that Griffin sought to harness with Owens and Johnson in his group, and that indeed proved to be the case; the quartet eventually gained enough recognition that by 1935 they were regularly venturing to neighboring Virginia towns such as Richmond and Tidewater and even into parts of the Carolinas for personal appearances. By this time, Griffin ‘s modest ambitions had been more than fulfilled, and as he felt more certain about his haircutting business than a singing career, he retired from the quartet, replaced by Portsmouth tenor William Langford, a veteran of several area singing groups. In the summer of 1936, as the elderly and sickly Ford began to miss more and more of the Gates’ growing number of engagements, Johnson, Owens, and Langford succeeded in talking the parents of 16-year old bass singer Orlandus Wilson (their favorite fill-in for Ford) into permitting their son to join the group as a permanent member. With Wilson aboard, the look and sound of the group struck a new balance. 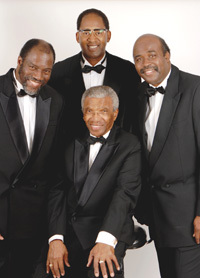 Each of the four brought specific talents to the quartet: Langford was a showy, melodramatic lead singer in the standard barbershop/pop mold, with a tremendous range that allowed him to easily slide from baritone all the way up to a falsetto soprano; Johnson, the most jazz-influenced of the group, had developed a grin-and-wink hipster narrative style the likes of which gospel music had never before seen; Owens, probably the best pure singer in the quartet, was a master at harmonic invention, allowing him to shuttle between Langford and Johnson’s leads as the arrangements warranted; and Wilson, the bass singer, anchored the foursome’s songs with an intrinsic sense of timing and syncopation that allowed them to jump, glide, bounce and swing. Together, they were poised to set gospel music on its ear. Through regular appearances on radio programs in Columbia , SC and Charlotte , NC , and with performing dates in churches throughout Virginia and the Carolinas , the Golden Gate Quartet was, by the middle of 1937, the hottest gospel act around – a fact that did not go unnoticed by Bluebird talent scout and producer Eli Oberstein. That August, Oberstein recorded the Gates in a field recording session at the Charlotte Hotel , and so primed was the group that they laid down fourteen tracks in two hours flat – all but two of them in just one take! 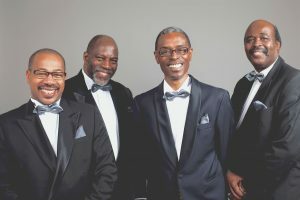 The release of their debut 78, the signature song, “Golden Gate Gospel Train,” brought them immediate recognition, and the quartet’s highly successful recording career was on its way. The Golden Gate Quartet made their final RCA-Victor recordings at a milestone June, 1940 session with legendary folk singer Leadbelly (the fruits of that collaboration can be heard on the RCA Heritage Series album, Leadbelly: Alabama Bound). Not long thereafter, lead singer William Langford left the Gates to form a new group, the Southern Sons (some of whose best work can be found on another RCA Heritage Series release, I Hear Music In The Air), and Langford’s place was taken by old friend Clyde Riddick, who had been an early replacement for Griffin even before Langford joined the group in the thirties. The 1940s found the group making cameo appearences in a number of films, including Star-Spangled Rhythm, Hollywood Canteen, and A Song Is Born, and continuing to record (for Columbia and Mercury). In 1948, Willie Johnson exited the group, but the Gates were able to absorb the loss, as they would later also manage to do when Owens departed in 1950 to become an evangelist preacher. The group went through several more personnel changes during the early fifties, but when they made their initial European tour in 1955, they were delighted to discover a new worldwide audience waiting for them with open arms. 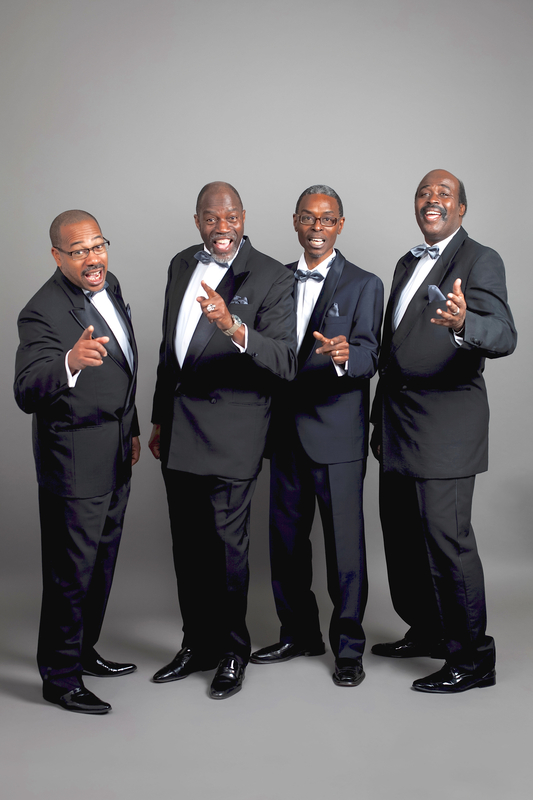 It is in Europe that they’ve primarily lived and worked for the last fifty years, with first tenor Frank Davis, second tenor Michael Robinson, baritone Paul Brembly and basso Terry François rounding out the group’s current, and still extremely active, lineup.